Guitarist and songwriter Tom House, author of the poetry collection The World According to Whiskey, sat down with Radley Balko of the Nashville Byline blog to discuss his poetry and play a few songs. House began writing at 17 and moved to Nashville, where he tells Balko that singing got you “free beer, maybe a sandwich.” In addition to The World According to Whiskey, House founded the magazine Raw Bone, has written several poetry and chap books, and recently released a new CD. Are there any poets who particularly influenced you? [W]hen I discovered Bukowski, it really hit me that there was a whole other kind of poetry, a more conversational sort of poetry. It was more storytelling. I think that’s where poetry and songwriting started to convene for me. I have a friend, David Rigsbee, who says poetry is a slice across the throat of time. You walk into a scene and you pick out all the details that are important to the scene, and that’s the poem. Songwriting is kind of like that too. You write about some unsavory characters. Drunks, addicts, mental patients, murderers, scoundrels. How do you get into the heads of the people you write about? I think on those first-person songs, it’s about getting locked into the head of the character, and then to not feel any embarrassment about being there. It’s a lot like method acting, I think. You try to become the person you’re writing about, to speak like they do, and think like they do. I love Tom Waits and Richard Thompson, who are both so good at that. But I like the old time stuff, too. There’s some unabashed darkness in those old songs. That song was inspired by the book Things Fall Apart, by the South African author . . . Achebe. That’s one of the lines in the song, “things fall apart.” The song is a somewhat pessimistic view of the United States in the 21st century. I’m not anti-American. I’m very pro-America when it comes to the things America is supposed to stand for. I just don’t think we stand for those things anymore. We’ve lost our core. Tom House – “Nothing At The Core” from Mark Crozier on Vimeo. To read the full interview, visit the Nashville Byline blog. 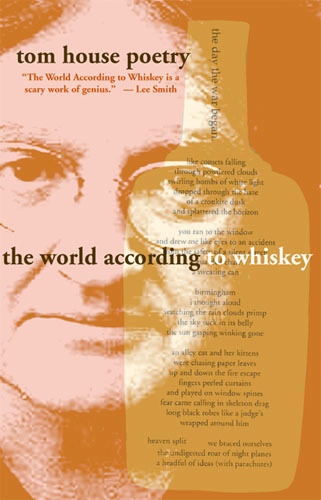 The World According to Whiskey, by Tom House, is available from NewSouth Books, Amazon, or your favorite local or online book retailer. You are currently browsing the archives for the Tom House category.